Garlic is a food that healthy eaters either love or hate. But if you're trying to watch your waistline or improve your diet, garlic nutrition can give you a boost. Find out how to prepare garlic and why you should add this low-calorie food to your meals. A 4-gram clove of garlic provides almost no calories. You'll only add four calories to your total intake if you consume the whole clove. 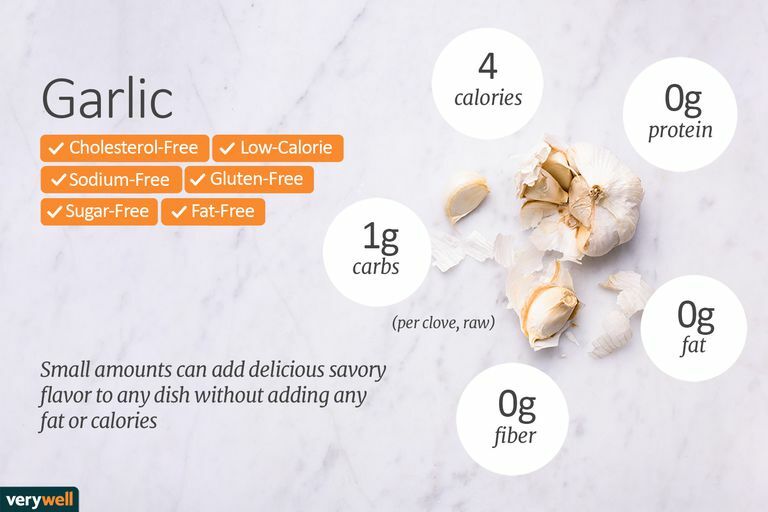 Because you are likely to eat so little of the food, garlic calories are not likely to make a noticeable difference in your daily food intake. The calories in garlic come from carbohydrate, but again because the calories are so low, the carbs in garlic are also very low. There is no fat in garlic. There are few vitamins and minerals in garlic, although a single clove does provide a small amount of vitamin C and manganese. Garlic can support your healthy eating or weight loss program. Because it is so flavorful, a tiny amount can add a delicious savory flavor to your food without providing any fat or calories. Garlic can also be used as a replacement for salt if you are trying to cut back on sodium but still want food that has a satisfying taste. Garlic has been used to treat illness and disease for thousands of years. In fact, there are biblical references to the use of garlic in medicine. According to some sources, Hippocrates prescribed garlic for a variety of illnesses and early Olympic athletes used garlic as the first "performance enhancing" drug. So how can garlic help you today? Some people believe that consuming garlic can help cure your common cold faster, help to reduce cold sores, aid in the treatment of acne, banish mosquitos and even improve the texture of your hair. None of these benefits have been proven, however. Can you expect to experience all of these benefits if you boost your garlic consumption? No. Scientists have not established a direct cause and effect relationship between garlic and these benefits. In fact, some studies have concluded that the benefits of garlic have been overstated. But since garlic is inexpensive and can benefit your diet in other ways, there is usually no harm in adding it to your diet. According to the National Institutes of Health, garlic is probably safe for most people. No. Garlic is not really an herb or a spice. Some refer to garlic as a vegetable, but this pungent food doesn't fall neatly into any category. Garlic is actually a member of the lily family. That's right, this pungent food comes from the same family as the tall beautiful flowers you're used to seeing in the spring. Like lilies, garlic bulbs grow underground with a shoot that grows above ground and roots that extend below. The part that we eat is the bulb. Onions, leeks, and shallots are also members of the lily family. Why do my eyes burn when I chop garlic? Garlic contains an enzyme that can cause your eyes to water. When you slice or chop garlic the enzyme is released. If you get the substance on your hands and then touch your eyes with your hands, it can cause slight irritation and your eyes might water. No. You should remove garlic skin before adding garlic to your recipes. What is the best way to remove garlic skin? You can buy a tubular silicon device to remove garlic skin, but most savvy cooks remove it without additional tools. Some cooks shake garlic in an enclosed bowl or container to remove the skin. Others smash garlic with the broad (flat) side of a knife to remove part of the skin and then remove the rest with their hands. What is the best way to select and store garlic? When selecting garlic at the grocery store, avoid buying any bulbs that are starting to get soft. Once you get it home, store it at room temperature in a wire or mesh container. Avoid using plastic bags and keep the tops attached to keep garlic fresh longer. Chopped garlic can be added to almost any savory dish for a burst of flavor. To get you started, here are some recipes featuring garlic. Garlic is a common spice allergy trigger, according to the American College of Allergy, Asthma, and Immunology. According to the source, "an allergic reaction can be caused from breathing, eating or touching spices. Symptoms range from mild sneezing to a life-threating allergic reaction known as anaphylaxis." The medical organization recommends that if you suspect that you have a spice allergy you should see a board-certified allergist for proper diagnosis and a custom-made management plan . National Institutes of Health. Garlic. National Center for Complementary and Integrative Health. Web. 2017. Tsai C-W, Chen H-W, Lii C-K. Garlic: Health Benefits and Actions. BioMedicine. 2012;2(1):17–29. Can Pineapple Be a Healthy Addition to Your Diet? What Are the Health Benefits of Raspberries? What Nutrients Does Bulgur Provide? Are Creamy Artichokes Really a Fatty Food? What Are the Nutrition Facts for Apricots?